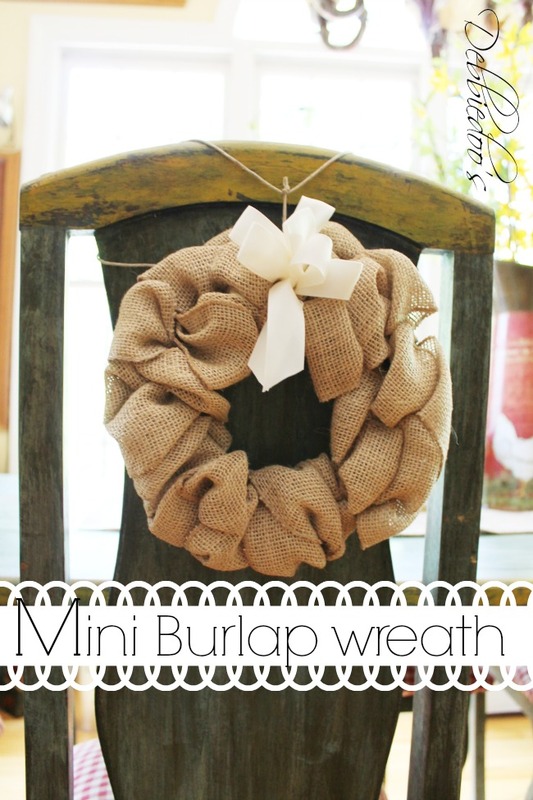 Today, I am sharing a burlap runner, a burlap pillow and a mini burlap wreath. We are talking top notch quality here today! Yes, you are at the right blog, hold on to your hats there. has a beautiful Etsy shoppe. 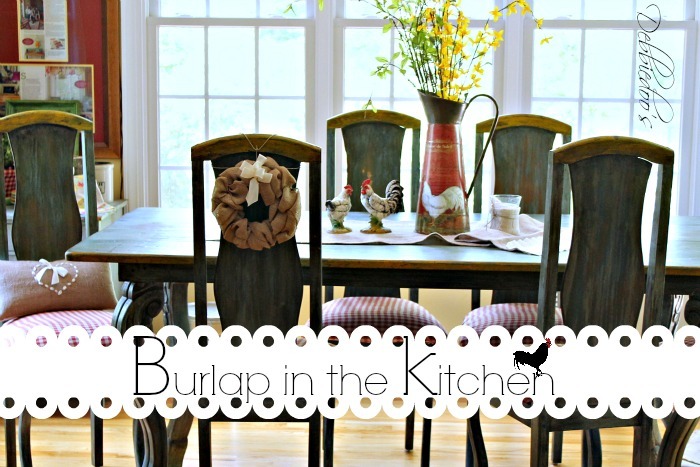 You all already know what a fan of all things Burlap projects I am. Love em, simply love them! 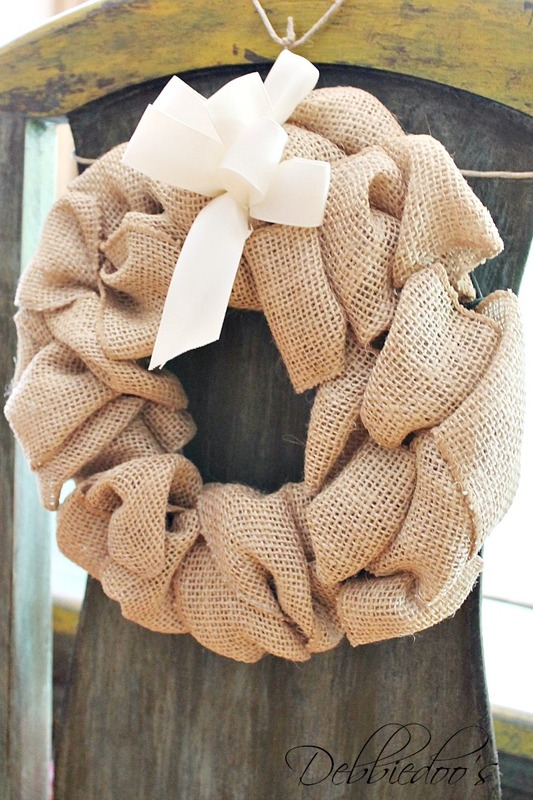 I have been wanting one of these cute burlap mini wreaths for a while now. I think they look adorable on a chair. Just think, during the Holidays, I can embellish this cutie to go according to the season. 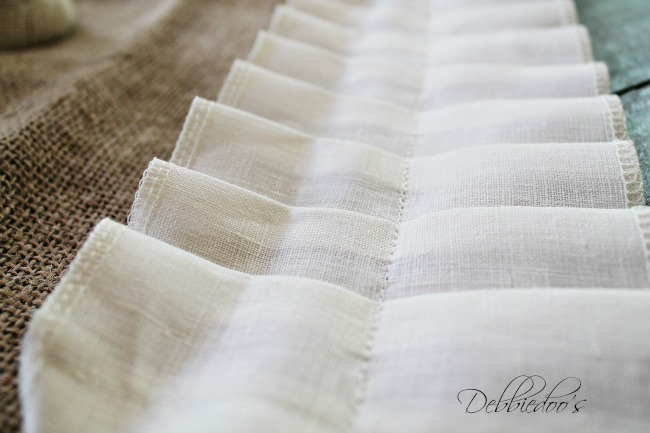 Ann stepped out of her usual if I may add gorgeous Linen textiles and tried her sewing hand at Burlap. I certainly am glad she did. She really enjoyed it, as it shows in my goodies. It’s all in the details, as you can clearly see. 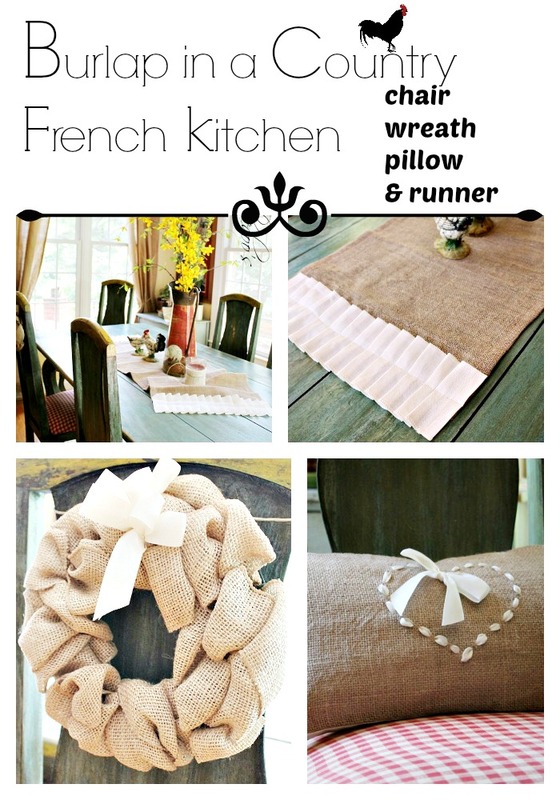 These burlap pieces could not be a better companion to my Country French decor in the kitchen. Loving the ruffle on the runner. Oh to be able to sew like this. Ann, I admire you, your work, and I am so happy to share your Etsy and all your lovely work you do. 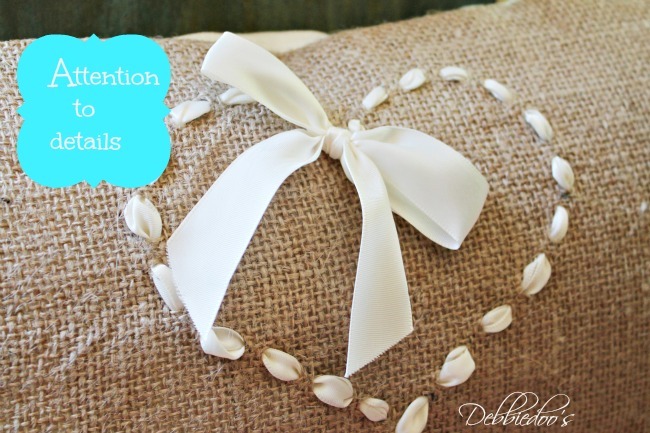 I know you want one of these wreaths, no wait, the pillow…no, the runner…. In fact, the pillow would even look cute in our bedroom next. Sign up to have me delivered! Look at all that burlap cuteness. And yes, FYI I giggled at the sewing reference “therefore it’s not mine”… ah ha ha ha ha. Love them all! 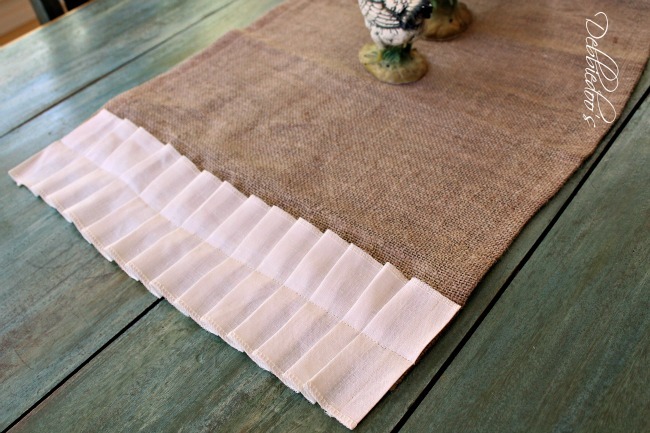 I think the table runner with that lovely ruffle is my fave. I can never find burlap with a tight weave like that. We’re really going to be twinsy 😉 I am ordering that runner!! Sew cute!! I love Ann’s pieces and the ones you have selected in your home are wonderful! Very Cute Debbie. I am heading over now to check it out. Love that runner. Ann did a great job on those pieces, Debbie! They look great in your home! Beautiful, Debbie! 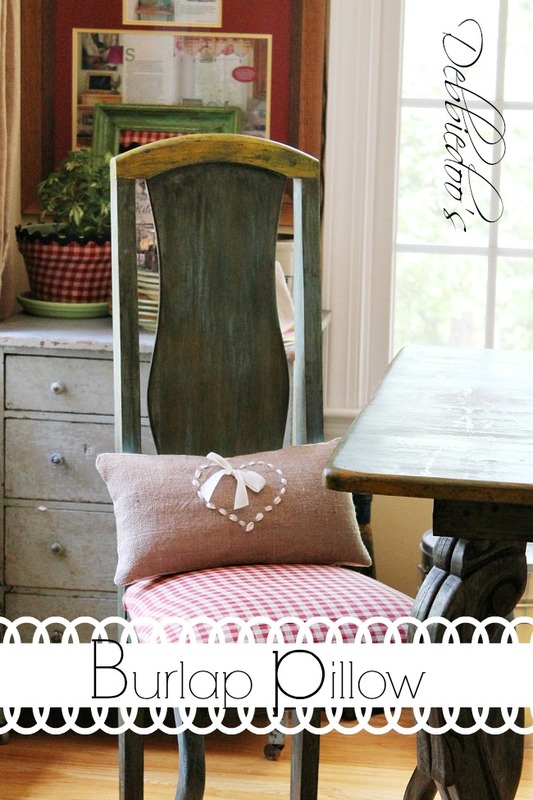 I love them all…and the detailed sewing on the pillow is adorable! I’ve been to her shop before, she does gorgeous work. Love the wreath, so cute, and how Anne did the heart on the pillow! Wow what a deal beautiful things Ann always has to offer. I am going to make sure I buy things from her shop when we get the new house finished because I can’t sew at all. I want one of those runners for sure!! I won’t get the sale but I have to wait for now. 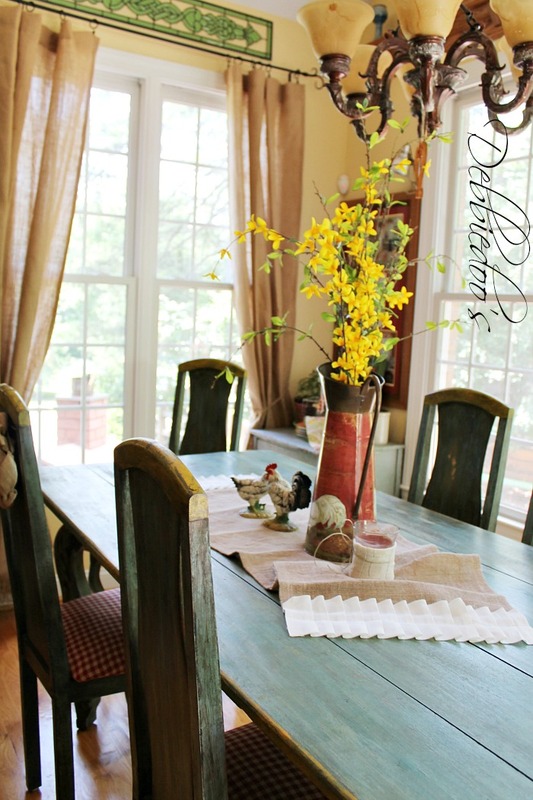 Love the runner…..just might have to make one for my french country kitchen! I did not make the wreath, I bought it on Etsy and left the gals name there. Ann Drake from on sutton place made it.